A New Jersey Muslim community leader attending tonight's State of the Union Address with Sen. Cory Booker also serves as treasurer of a political group which strongly supports the Muslim Brotherhood and demands its return to power in Egypt, documents discovered by the Investigative Project on Terrorism show. Ahmed Shedeed is president of the Islamic Center of Jersey City. In explaining his invitation, Booker said Shedeed "has spoken out for religious tolerance and mutual understanding" and shows "how the diversity of America makes us all better." Shedeed also serves on New Jersey's Homeland Security Interfaith Advisory Council. It is unclear whether Booker knows of another leadership post Shedeed holds – treasurer of the Egyptian Americans for Democracy and Human Rights (EADHR). The group emerged in 2013, after Egypt's military ousted President Mohamed Morsi – a member of the Brotherhood's Freedom and Justice Party – from power. The move came after millions of Egyptians took to the streets to protest Morsi and the Brotherhood's attempts to concentrate their power at the expense of the country's crumbling economy and infrastructure. In the U.S., the EADHR launched rallies in several cities, including Washington, D.C. While they avoided mentioning the Brotherhood and emphasized a desire to see the "legitimate government" restored, Brotherhood political leaders spoke at the rallies and many organizers were part of groups serving the Muslim Brotherhood in America. 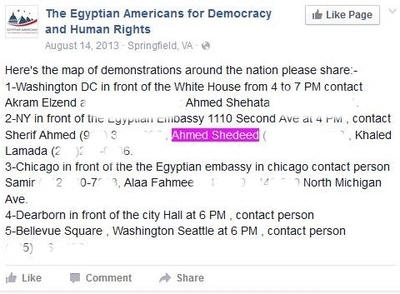 Shedeed is listed in an August 2013 Facebook post as a contact for a New York rally. Many Democrats in Congress made a point of inviting Muslim guests to the annual presidential speech, as a response to an "alarming rise in hateful rhetoric against Muslim Americans and people of the Islamic faith worldwide." Booker's invitation of a Brotherhood supporter, however, is another example of elected officials making poor choices in trying to showcase the breadth of Muslim American ideology. As the IPT reported Monday, two Council on American-Islamic Relations (CAIR) officials have been invited, too. CAIR has its own direct connection to the Muslim Brotherhood. The organization was founded as part of a Brotherhood-led Hamas-support network in the United States. In addition, FBI records obtained by the IPT through the Freedom of Information Act include an eyewitness's claim that CAIR's founders sought the Brotherhood's blessings for their founding bylaws. I don't know why more of this type of reporting is not blasted all over the main stream media (MSM). The average American citizen, especially the voters, know little or nothing about the dangers Islam poses on all of us...the entire world for that matter! Also, I thoroughly disagree with those who refer to it as, 'radicalized'...it's Islam pure and simple. One of our so-called allies, Saudi Arabia, is really one of our worst enemies. They finance dang near everything that is going on within our country's educational system...promoting Islam and re-writing American history. I'm sure you are aware of all these things but there's just not enough of it in the MSM.